Prime Minister and Energy Minister dedicate lower part of Leviathan gas platform. 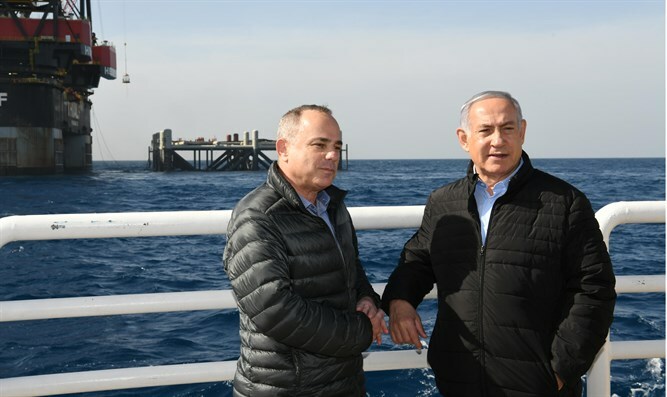 Prime Minister Binyamin Netanyahu and Energy Minister Dr. Yuval Steinitz (Likud) inaugurated at sea today the lower part of the Leviathan gas platform. During a tour of the command bridge near the drilling site, the Prime Minister and the Energy Minister heard an overview of the process to set up the platform. The Prime Minister said "completion of the Leviathan gas rig and the flow of gas from this field later this year is a critical component of the strategic power, energy, economic, and political strength of the State of Israel. "From here, a gas pipeline will connect us to the gas economy in Europe, reach our Arab neighbors, and first and foremost, provide clean gas to Israeli citizens. Every shekel of gas that comes out of the sea - two-thirds of it will go straight to state coffers. These are hundreds of billions of shekels that will serve us in education, welfare, and other vital needs of the State of Israel and the citizens of Israel. This is a tremendous revolution - Israel is becoming an energy power. The State of Israel is independent and it's not dependent on anyone for its energy needs. This is tremendous news, and I'm proud it's happening now, this year, for all of you." Netanyahu added, "We'll provide all the energy needs of the State of Israel from clean energy that doesn't kill like coal. Two-thirds of the money coming out of the sea goes directly to the coffers of the state for the needs of Israeli citizens. "This makes Israel independent from the point of view of energy and gives us tremendous power with the pipelines we bring from here to our neighborhood and to Europe, which gives us political power, economic power and, of course, energy power. This is very great news for the Israeli economy and the State of Israel." Minister Steinitz said that this is a great day for the energy sector and for all citizens of Israel. "The process that began three years ago with the formulation of the gas pipeline led to the development of the Leviathan gas field, which will change the Israeli economy for decades to come, will bring billions of shekels to the state and its citizens and, most important, will enable the State of Israel to get rid of the polluting coal and close the power plants in Hadera and Ashkelon," he said. "Developing the Leviathan reservoir will also have important political significance. With the start of gas production during the year, Israel will begin to export the surplus gas to Jordan and Egypt, and in the future to European countries as well. The Leviathan gas field is the largest natural resource discovered in Israel, and the barge base's arrival symbolizes our entry into the final stage of project development." Minister Steinitz noted the first part of the Leviathan platform arrived in Israel after a few weeks at sea. The platform's legs stand about 98 meters high, weigh about 15,000 tons, and will descend to a depth of about 86 meters. "In the second half of 2019, the operational part of the platform will be installed on the lower part that was inaugurated today, and natural gas from the Leviathan reservoir is expected to flow at the end of the current year, according to the timetables set out in the gas plan."